not pay for this paper. This update regarding Oppenheimer Park actions as they relate to overall improvements of the park grounds and part of the motion put forward by Councilor Jean Swanson. Planned Improvements include: · Large Grassy Field - the entire field will be fenced off on April 24th for maintenance and reseeding and will reopen on June 11th. · Children's Play Area - the children's play area will be power washed, the wooden structure which is rotting will be removed and some new soil/plants will be planted in area just by the gate. · Medicine Garden - this area will be power washed, fenced off for maintenance and reseeding. New soil will be placed in the rock beds for gardening. · Portable Toilets - the park board purchased 4 portables (2 accessible) in response to Councilor Jean Swanson's motion. The portables will be placed on the sidewalk area on Powell St. and Jackson. The portables will be serviced daily and only open when the park washrooms are not open. The opening! closing ofthe portables will be as it is with the other public washrooms. The portables will be delivered this week. Needle Boxes - an additional needle box will be installed on the fencing along Powell Street. months protesting outside the demolished Woodward's site in order to ask for more affordable housing units for low-income groups. As a result, three floors of the building, adding up to one hundred and twenty units, were assigned to house the disadvantaged. From my twenty plus years acquaintance with James, I know him to be sincerely dedicated to the highest humanitarian principles and ideals in his work as a health care professional and as a seeker of world peace. As an anti-war activist he has participated in many protests against war and forced occupation. So much more could be said of James, particularly where help to individuals is concerned. Not infrequently has he helped find jobs for some, helped others financially, as well as helping immigrants with translation services and in navigating the bureaucracy. I and everyone else who has had dealings with James trusts his open and honest approach to life and hope that he will overcome his health problems in order to continue giving the help he loves to give. Yours truly, If time will be a friend to me Melissa Eror and i can make it mine There'll be an hour of love for every soul an hour that lasts eternally The shining of the sun will be A promise of a joy DTES Information Session for VOAF that beams forever and forever. Call for Outsider Artists! **Now extended through April 22** Are you an Outsider Artist 19 years and older residing in Vancou ver? Want to share, learn, and connect? Ready to perform/show/ sell your work? The 2019 Vancouver Outsider Arts Festival is happening at Roundhouse Community Arts & Recreation Centre August 9 - 11 VOAF is dedicated to supporting self-identified outsider artists who face social exclusion and other visible/invisible barriers to sharing their work. APPLICA nONS FOR VISUAL & PERFORMING ARTISTS OPEN NOW. Bring 4 pieces of artwork to be photographed for your application if you do not have access to a camera. All DTES Artists are welcome and encouraged to attend! CHALLENGE OF CHANGE Fear tainted dreams hold me fast as I stumble about this reality Afraid of tomorrow all day long is the fear that I fear most of all If I could dream beyond what I see then maybe I ~ould leave all of this behind And predjudism runs hand and hand with my ignorance again And I am back on first base again To beat my feet to that rhythm again is no melody to me is no melody to me As my snake like spirit sheds it's torment I reappear Wishing to be beautiful And the moth that I be seeks olde clothing. The Spice of Life is Change I think the Creator gave us seasons so we'd get used to changes and welcome them in. Have you ever re-spiced an old dish? This can be too much - unedible to eat whereas a new dish - newly spiced can put more zip into life ... or you can keep the same old bland ingredients and spice it up. Seasons can change against our wishes for to leave room for the new we have to say goodbye to something old, something familiar, or comfortable. and the who or what may also say goodbye to us first and this can be painful...almost as painful as physically giving birth to the something, or someone new. but without the spice of change all can be bland ... boring. .. offering no challenge as does going with the flow, the tides and enjoying the ride with new friends, new habits or enjoying change and a new experience with someone or something old for what we can count on most in life is change .... - inga g.
.Do youhave sorne free time? 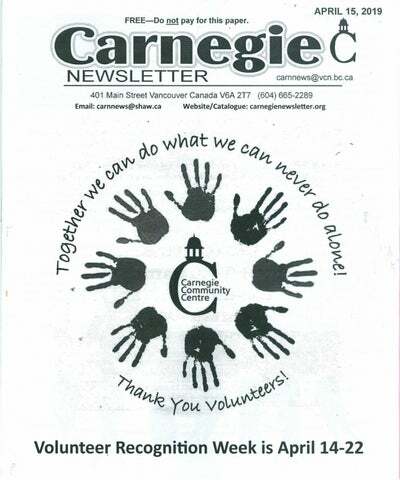 Carnegie has a fun and rewarding Volunteer Program with a wide variety of opportunities! Food Prep. Serving, Dishwashing. Baking. Runner, and Sandwich Maker. Pool Room Monitor Check memberships and monitor use. Reception - Monitor free phone and ticket distribution. Seniors' Coffee Seller Cashier and lounge monitor. Computer Room Monitor Check memberships, maintain wait list and monitor computer use. Weight Room Monitor Check m,emberships and ensure safe environment . .-ro'" ,y .. Adult Learning Centre One on one tutoring, computer tutor and reception positions. Special Events Dances, music, karaoke, opera, theatre. and more! Help with setting up and taking down tables and chairs, monitoring the door etc. This week we want to make sure you feel loved, appreciated, respected, valued, recognized, happy and most importantly grateful! There is nothing more powerful than gratitude. We should all take a moment this week to feel grateful that we have this unique and special place called Camegie: The Living Room of the Downtown Eastside, and a TRUE COMMUNITY CENTRE. Thank you for the part you play in making it the amazing place it is. We are truly grateful! SIGN UP in advance for everything in the Volunteer Program Office on the 3rd floor. First come first serve. We want everyone to get a chance to go on an out trip so pick. the one you want to go on the most and sign up for the that one. For any others you are interested in we will put you on stand by for it. Marching to support the Oppenheimer Park camper's outside Vancouver City Hall! Many joined us either in writing letters or support, marching outside City Hall, and/or speaking to City Council on this important issue. This being the case, there are still some redeemable things about this building. There are people who have faced many barriers finding comfort in these walls. For some women, Olivia Skye is a new start, a chance at some peace, some quiet, some solstice. Atira Property Management operates the building named Olivia Skye. Olivia Skye is a large building with over 190 studio and junior suites. We decided to However, word on the street is that some conditions get some research done so we could look into the are not exactly up to "par" in many of the buildings costs of renting a small suite at this building. that are managed by the same company. And people who are homeless in the DTES are asking where is When viewing the website, Olivia Skye looks as if they are renting to people who are "working" and not our affordable housing and what standards are being met? The overall lack of true shelter rate housing the homeless who are sleeping on our streets. rates is an indicator. According to Atira CEO Janice Abbott, ... "for the HILs units, we're really trying to focus on folks who work in local-area businesses. We're trying to prioritize folks who work in Gastown, Chinatown, and in the area." For example, 52 of the units rent at B.C. 's welfare shelter rate, 68 units rent to people earning $49,000 or less at housing-income limits (HILs), and 78 units are pegged to the city's low-end-of-market (LEM) rates. The 42 shelter-rate units are reserved for women or couples where a woman signs the lease. his means 118 of 198 apartments rent for $1,000 a month. People are talking of working on true affordability and not just waiting to have service providers provide it. It is true that poverty has become an industry and especially in the DTES. True, some deserve acclaim for truly helping the community. However, sometimes help is actually hinderance in disguise. People on the street are fed up with sub-standard conditions, strict rules, being monitored, and being mistreated. People in the DTES deserve safe and affordable housing, and shelter as a human right. Oppenheimer Park Update CCAP is proud to announce some success in terms of the motion B.4 being passed by Vancouver City Council to Help the Campers in Oppenheimer Park. The motion was revised to state A. THAT Council direct staff to meet with BC Housing staff to continue to explore ways to fund temporary and/or permanent accommodations, with appropriate support services to house Oppenheimer Park Patrons. B.THAT the City work with Park Board staff to temporarily implement a warming station in Oppenheimer Park or other city owned land within close proximity. patrons including 24 hour access. Are you worried that gentification is destroying whatever left of our community we have? Are you an ethical person, school, or organization? Are you interested in an Indigenous perspective on the development (and it's effects) in the OTES? Would you like to better understand the dynamics and consequences of gentification in this area? We are hosting these with two great tour guides who are people that have faced, and continue to face, this intense discrimination. The cost of the tours goes to paying our guides and etc. We off these tours to groups or to individuals. We will be presenting to the School Board and have presented at a International Teacher's Social Justice convention and are also booked to present at the BCTF annual convention near the end of May. CCAP has developed an ethical Anti-Gentrification tour which helps local area residents and builds a strong sense of our community and the challenges it faces due to constant gentrification that continues If you wish to book a tour or book your class, eotoday! workers, fellow teacher, organization and etc. just email C.CAP at elli@carnegieaction.org or call us C.CAP and it's members have created and are today at 604-665-2105. hosting Gentrification Tours in the OTES. This is not the for-profit tours that have been occurring. These are ethical tours done by local area residents. The money helps fund the tours and our tour guides. The tours give back and don't take away as other tours do. We do not exploit the people, we work for them and with them! The history of this area is marked with exclusion and discrimination as racism is a very real and dangerous problem for the people who are oppressed the most. This talk will be an opportunity to discuss related struggles in the UK and Canada, and to think about ways of building solidarities between housing movements across the globe. What are we doing right? What can we prevent, improve, and resolve based on what they are doing in the UK? Are we as progressive as we state we are? Are they as progressive as we may think? These are all questions that can be asked and answered during this talk and during the tours themselves that take place on the 30th. need to be taken down. They are monuments of displacement. When the bulldozers came in 1972, it mobilized the community and they hired Howard, a Black woman who worked on the project and sat on an advisory committee which included the City, and etc. At the Nora Hendrix Place rent is 375 and is set at shelter rates. They targeted 50/50 men and women. Hidden homelessness was an issue. Such as when people couch surf, stay with friends and stay women's shelters. People are served two meals a day and they have access to mental health professionals 24/7. 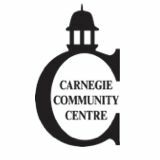 The Carnegie Community Action Project is a project of the board of the Carnegie Community Centre Association. CCAP works mostly on housing, income, and land use. issues in the Downtown Eastside (DTES), so that the area can remain a low income friendly community. meetings! Downtown Eastside residents who want to work on getting better housing and incomes and stop gentrification are welcome to attend. Lunch is provided. Miili [i'~ili[l].eg. !l =;fl, )~:m~ ,~~~. Thank you to Vandty for supporting CCAP's work. Support for this project does not necessarily imply that funders endorse the findings or contents of this report. we need your help: • You believe that homelessness shouldn't exist. • You think that healthy food is better for the body and mind than junk. • You believe that pushing a pen, most of the time, doesn't solve poverty. • You can hold a hammer or use powered tools. • You can share understanding, love and compassion. • You are able to think and follow instructions. • • You like gardening or fishing. • You can give a few hours per week for the needy people. • You are bored of feeling useless. Bio-electrode Therapy - Free Presentation A new safe and simple treatment method for opioid withdrawal distress, combining science ofbioelectricity & acupuncture meridian theory. steps might land them in a police file. And how many people will shy away from participating in a protest or campaign when the result could be an RCMP file? To be clear, the software doesn't allow police to see private messages on platforms like Facebook or Gmail. But as we saw with the Cambridge Analytica scandal, it's possible to compile a great deal of information on people without seeing their private messages. Third, this isn't an RCMP problem (mostly). Police are judged on their ability to solve or prevent crimes, not on their concerns for privacy. Their interest is in doing anything legal that makes those jobs easier. So it's not surprising they want to be able to track as many citizens as possible. But the RCMP has chosen to skirt the scant privacy protection that does exist in implementing Operation Wide Awake. And it has refused to release its policies on the monitoring program, how people are tracked and how the information is shared. Which raises at least the prospect of citizens' information being shared with other police forces, border service agencies or even foreign governments. Fourth, this is a serious failure of government. The laws around privacy and charter rights have utterly failed to change to reflect today's world. We still require warrants before police search a home or tap a phone. But online surveillance and profiling is arguably a greater threat to our rights, and there are virtually no controls or oversight. Even the few protections in place are flimsy. All government departments - including the RCMP - are required to complete a Privacy Impact Assessments to identify "potential privacy risks" and make the information available to the public. But Carney found that for more than a year the RCMP has been using the software to monitor Canadians without completing the assessment. The project, two years in the making, is in the design stage, an RCMP spokesperson said, so an assessment isn't required. Surely the time for an assessment is before the decision to buy the software and launch the tracking program, not after it's in place. And fifth, and perhaps most critically, there are no signs of change. In the post-9111 world, security has become a dominant concern. But only security from bad acts by people the state has deemed suspicious - not security from excesses of government surveillance, for example, or increasing inequality or shrinking opportunity. Security is important. But without oversight, rules and accountability, we are at risk of trading our rights as citizens, our chance to campaign for change, for a false promise of safety. ~ It's not a good deal. " Personal Values I've got dignity - for I've got worth I've got value and it ain't got nothing to do with money honey. So don't insult my dignity - my worth for money's a tool, cold cash and that is all It's not a heart, a conscience, an intellect, and 'unlike me' - unique as can be money can be replaced. inga g.
THIS NEWSLETTER IS A PUBLICATION OF THE CARNEGIE COMMUNITY CENTRE ASSOCIATION Articles represent the views of individual contributors and not of the Association. WANTED Artwork for the Carnegie Newsletter -Small illustrations to accompany articles and poetry. -Cover art - Max size: 17cm(6 %")wide x 15cm(6")high. -Subject matter pertaining to issues relevant to the Downtown Eastside, but all work considered. -Black & White printing only. -Size restrictions apply (i.e. if your piece is too large, it will be reduced and/or cropped to fit). -All artists will receive credit for their work. -Originals will be returned to the artist after being copied for publication. -Remuneration: Carnegie Volunteer Tickets Please make submissions to Paul Taylor, Editor. The editor can edit for clarity, format & brevity, but not at the expense of the writer's message.